The county seat of San Juan County, Silverton is a small statutory town in the southwestern part of the state of Colorado. Surrounded by mountains, the Silverton is mostly classed as a National Historic Landmark District and has close ties with the town of Durango, with the two towns being linked by the famous Durango and Silverton Narrow Gauge Railroad. Silverton covers an area of just 0.85 square miles and has a very small population of around 630 people. Silverton is one of the highest towns in the United States and, as its name suggests, was founded as a silver mining town. The area was originally inhabited by native Ute people who were forced out to make room for white settlers. The town of Silverton was founded in 1874, with silver and gold being found nearby. The town enjoyed a prosperous period of mining for many years, during which time it attracted additional residents and businesses and formed close connections with Durango, but the mining gradually died down in the area. As Silverton moved into the modern era, the town began to rely more strongly on tourism to survive. It's a key historic location due to its high elevation and mining heritage, with the railroad being a popular tourist attraction, along with the two ski resorts in the area: Silverton Mountain and Kendall Mountain, with the former being one of the most extreme ski resorts in Colorado and only recommended for experienced and skilled skiers and snowboarders. The elevation of a town or city is the term which denotes how high or low that area is in relation to the mean sea level of Earth. Many major locations around the United States and the rest of the world are built at relatively low elevations of around 500 feet (152 m) or less due to their coastal locations, but the town of Silverton in Colorado has an extremely high elevation. Silverton's elevation is 9,318 feet (2,840 m), which is almost as tall as many major mountains around North America. Silverton is situated in very highly elevated part of the state. The top elevation of the nearby Silverton Mountain ski resort is 13,487 feet (4,111 m), while the highest point of the Kendall Mountain Ski Area is 13,340 feet (4,066 m). The nearby town of Durango, which is connected to Silverton by the famous railroad, has an elevation of 6,512 feet (1,988 m). 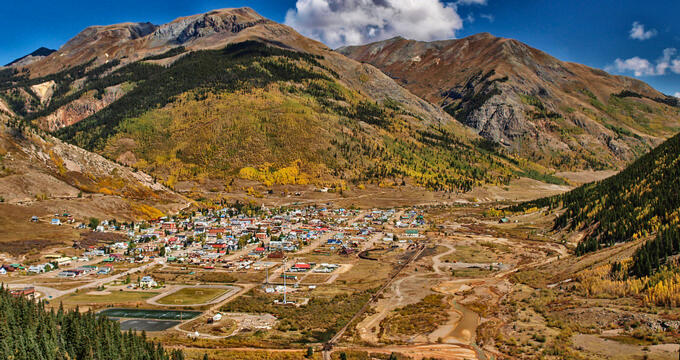 Silverton is almost the highest city in the entire state, but is narrowly beaten by another mining town named Leadville, which has an elevation of 10,152 feet (3,094 m). Visitors and residents of Colorado need to be prepared for high elevations in general as the Centennial State actually has the highest average elevation in America. The mean elevation of Colorado is 6,800 feet (2,070 m), meaning that large parts of the state are situated at very high altitudes. The capital city of Denver, for example, is nicknamed the ‘Mile High City’ due to its elevation of 5,280 feet (1,609 m), while other major cities like Aurora and Colorado Springs also have high elevations of 5472 feet (1,668 m) and 6,033 feet (1,839 m), respectively. Since it has such a high elevation and is surrounded by mountains, the town of Silverton has an alpine subarctic climate, resulting in mostly cold temperatures all year long. Temperatures drop below freezing point for the majority of the year. January is the coldest month of all with average highs of 34°F (1°C) and lows of -2°F (-19°C), while the warmest month is July, which has average highs of 73°F (23°C) and lows of 38°F (3°C). Small amounts of rainfall can occur in Silverton, CO all through the year, but the most common form of precipitation is snow, with over 150 inches falling on an annual basis. One of the most popular things to do in Silverton, CO is to admire and go for a ride aboard the Durango and Silverton Narrow Gauge Railroad to the town of Durango. The railroad has been operating since the late 19th century and runs for 45 miles along tracks that measure just three feet (914 mm). Other attractions in the area include the nearby Silverton Mountain ski resort, which opened in 2002 and is very popular with advanced skiers and snowboarders due to the challenging nature of its terrain. The mountain offers 1,819 acres of skiing, with thousands more acres of skiing routes in the surrounding area and mountains.